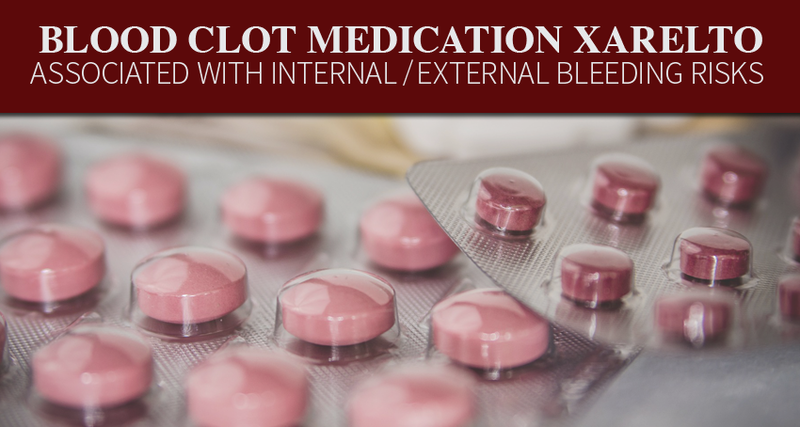 Xarelto (rivaroxaban) is an anticoagulant medication sold by Bayer Healthcare and Johnson & Johnson’s Janssen Pharmaceuticals subsidiary, and used to prevent blood clots from forming in patients with atrial fibrillation or those undergoing knee or hip replacement surgery. Approved by the U.S. Food and Drug Administration (FDA) in 2011, Xarelto has been marketed by its manufacturers as a safer and more convenient alternative to warfarin, a blood thinner that has been on the market for decades. According to Bayer and Janssen, Xarelto is easier to take than warfarin and other older anticoagulant drugs, because it doesn’t require regular checkups or changes in diet and lifestyle during treatment. 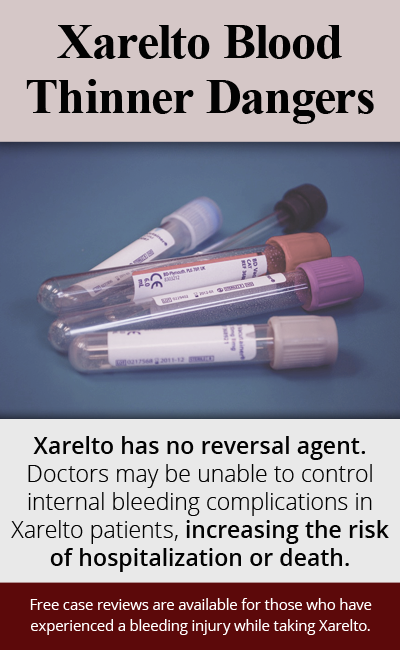 Although Xarelto is designed to prevent blood clots and blood clot-related injuries, adverse event reports submitted to the FDA in connection with Xarelto treatment indicate that patients taking the blood thinner may actually be at an increased risk for blood clots that may trigger heart attacks or strokes if they travel to the brain. In a Phase III study intended to analyze the safety of Xarelto, 73% of the 16,000 patients who took at least one dose of the blood thinner experienced serious side effects, including anemia and bleeding complications. The Xarelto drug label also currently carries a black box warning highlighting the risk of dangerous spinal bleeds called spinal hematomas, which can lead to permanent paralysis. Researchers have been examining the possible safety risks of Xarelto for years. In 2011, the New England Journal of Medicine published the results of the ROCKET AF study, which compared Xarelto to warfarin in patients with atrial fibrillation. According to the FDA, the study failed to provide adequate evidence that Xarelto is a more effective treatment than warfarin, and the new-generation blood thinner is also known to cause more internal bleeding than its predecessor. In light of the potential for Xarelto cause serious bleeding complications, former Xarelto users across the country are pursuing legal claims against Bayer and Janssen, alleging that the drug makers manufactured a defective drug and failed to adequately warn consumers and doctors about its risks. Alert: Due to statute of limitations, the time you have to pursue a Xarelto claim is limited. Call us right away at 877-459-8260, email us at intake@monroelawgroup.com, or complete the form on this page now.